The Executive Leadership Team shall conduct business between sessions of the US National Conference in accordance with the plans and policies of the US National Conference. b. Four laypersons and four clergy elected by the US National Conference. (1) They will include one minister and one layperson from each region. (2) They will serve four-year terms. c. Two clergy and two laypersons nominated by the bishop and appointed the Executive Leadership Team. (1) They will include one person from each region. (2) They will serve two-year terms. 2. No ELT member, except for the bishop, may serve more than eight consecutive years. a. One minister from the West region. b. One minister from the East region. c. One layperson from the North region. d. One layperson from the Central region. a. One minister from the North region. b. One minister from the Central region. c. One layperson from the West region. d. One layperson from the East region. The Executive Leadership Team, following the US National Conference, shall appoint an executive committee from its membership, not to include the bishop. The executive committee shall consist of a chairperson, assistant chairperson, and secretary. These persons will be appointed to two-year terms, and may be re-appointed to a maximum of eight years. 1. The Executive Leadership Team shall carry out the plans and policies established by the US National Conference. When issues arise that are not covered by the policies established by the US National Conference, the Executive Leadership Team shall determine the policy which will be followed until the US National Conference meets and deals with the issue. 2. The Executive Leadership Team shall decide questions of interpretation in the Constitution and the US Discipline. 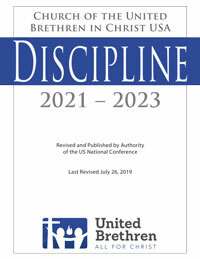 Between sessions, the US bishop’s interpretation will stand until the next meeting of either the National Conference or the Executive Leadership Team. 3. The Executive Leadership Team shall fill vacancies involving the US bishop. 4. The Executive Leadership Team shall appoint a nominating committee to assemble a ballot for submission to the US National Conference. The nominating committee shall notify the membership of the US National Conference of its nominations at least 30 days prior to the US National Conference. 5. The Executive Leadership Team will receive reports from the bishop, and from other persons as directed by the bishop, including information about finances, churches, ministries, and strategic direction. 6. The ELT shall develop and approve evaluation procedures for the US bishop, and shall approve job descriptions and evaluation procedures for the directors and staff. 7. Approve new appointments to the Higher Education Leadership Team. 8. Approve job descriptions and operating procedures of leadership for inclusion in the manual of operations. The executive committee will fill vacancies on the Executive Leadership Team. The ELT may suggest persons to be considered for appointment. The Executive Leadership Team will meet at least annually. Special meetings may be called by the chairperson. A majority of the members present shall constitute a quorum.